Our Lord speaks and we listen. His Word bestows what it says. Faith that is born from what is heard acknowledges the gifts received with eager thankfulness and praise… saying back to Him what He has said to us, we repeat what is most true and sure… The rhythm of our worship is from Him to us, and then from us back to Him. He gives His gifts, and together we receive and extol them. We build one another up as we speak to one another in psalms, hymns, and spiritual songs (Lutheran Worship, 6). Sacramental (Gift). 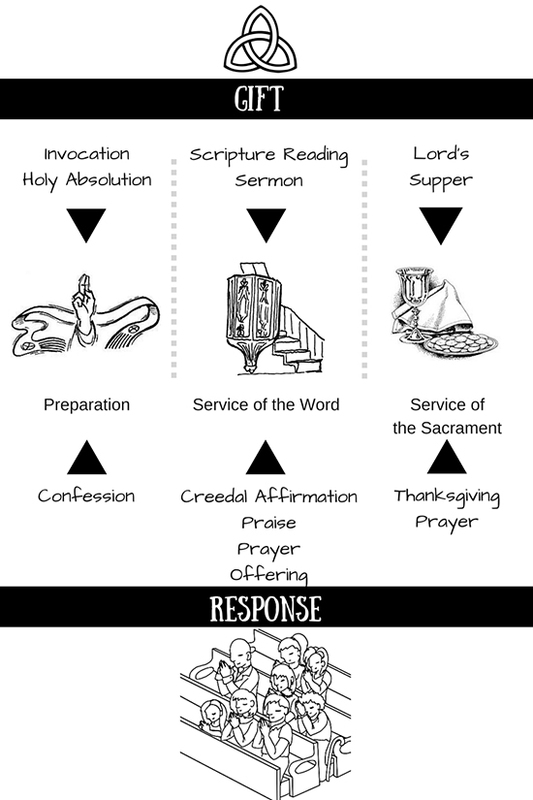 We use the term “sacramental” to describe the elements of the service that function as God’s gifts to us (Baptism, Absolution, Preaching, Lord’s Supper). Sacrificial (Response). We use the term “sacrificial” to describe the Christian’s words and actions towards God that arise out of the faith which God has imparted (i.e. prayer, praise, adoration, and thanksgiving). The liturgy is like a mountain range with two major peaks – God’s self-giving through the Service of the Word and God’s self-giving through Service of the Sacrament. The illustration below indicates this back and forth dialogical rhythm of communication between God and congregation. The concerns I have often heard from well intentioned evangelical friends is that traditional or liturgical services are too rote, man-made, or not biblical. This is a valid concern and I like to respond by walking them through one of the Divine Services in Lutheran Service Book (my synod’s most current hymnal), pointing out how nearly every confession, chant, song, hymn, prayer, and response is made up of Holy Scripture, which are thankfully annotated in small print on the far right of each section for validation. 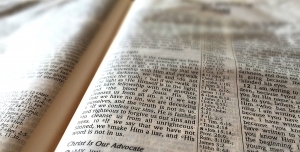 The particular style of service may be unfamiliar to those coming from non-liturgical traditions, however the charge of it being man-made or unbiblical is invalid. Next month, we will consider the “Syntax” of the liturgy (the structure which provides order and intelligibly communicates meaning through all that is happening).